Aristotle (384-322 BC) was perhaps the most important and influential philosopher of the ancient world, whose philosophical and theological works were commentated in the Middle Ages by the Arabian philosopher Averroes (1126-1198), who advocated the principle of twofold truth: religion, he said, is for the uneducated multitude, while philosophy is for the chosen few. This manuscript contains evidence of several former owners, including the library at Rochester Cathedral. 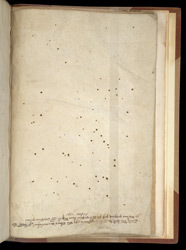 At the top of this flyleaf is an inscription recording that in 1321, William of [Tunbridge?] deposited the manuscript was in a locked chest in Oxford in exchange for a loan of 10 shillings. Below this is a faint leadpoint note mentioning John, a monk of Rochester.